I am loving this "truffle war". There's truffle on the menu at Koots! No guessing that this was my starter. 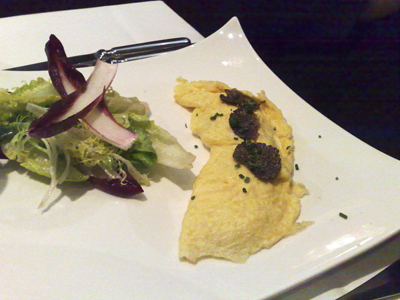 This is such a good way of serving truffle and really helps to show the truffle at its best. There's truffle slices on the inside surrounded by that still soft egg and the ones on the top are warmed by the omelette to help release their aromas - the scent as it is placed before you just makes you want to smile. 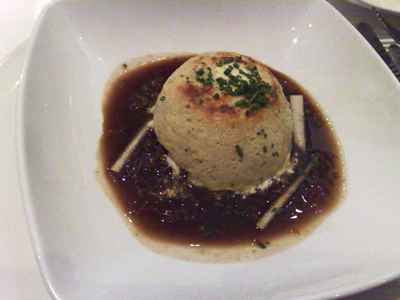 Paalo opted for the twice-baked Fourme d’Ambert blue cheese soufflé with caramelized shallots. Fabulous flavour and feather light. 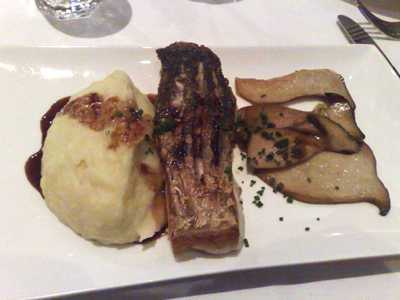 Paalo chose the Roasted barramundi fillet with a king brown mushroom carpaccio & celeriac purée. The mushrooms had been slightly pickled. 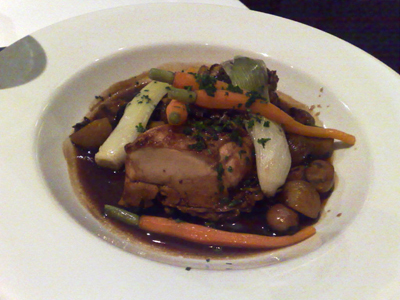 I had the slow braise of Milawa free-range chicken with autumn mushrooms, chestnuts, scallions and glazed carrots. Tender meat, excellent flavours - I was particularly enamoured with the chestnuts and how well they combined with the mushrooms. 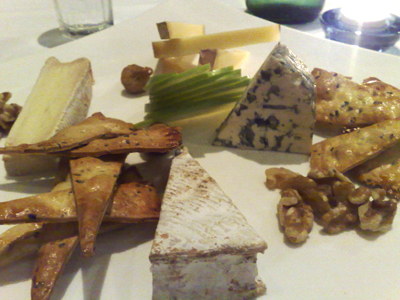 It is seriously one of the best cheese platters around. 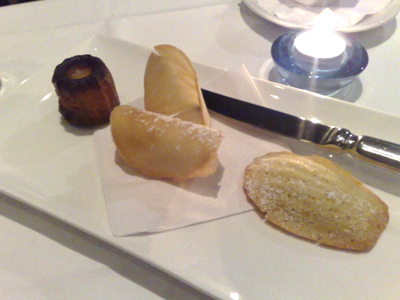 which consisted of the traditional Cannelés Bordelais, paper thin tuilles and a still warm madeleine that was devilishly good. more of a truffle blitz? You're right. I've never seen so many truffles on menus. I've even turned down two truffle freebees in one week although Monday I am truffle hunting. It's a good thing to see truffles becoming more accessible and moving from something you only ever saw in the very top end of the market. We had some apollo bay truffles today and they were amongst the best, extremely fragrant and top quality. Good luck on the hunt!